There are 420,000 people living in Oakland and District 7 has at least 14,380 pre-1978 housing units where at least 35,950 people are living inside homes with a high probably of containing lead paint. These people - occupants and owners - need to be made aware of the potential threat inside their housing so they can take care of it as soon as possible. We’re crowdfunding money to kick off a GTLO campaign to protect District 7 that includes outreach, predictive data to find lead, a Project Manager to run and report status, and stipends to pay community members to join and lead micro-community project teams. Lead house paint poison is invisible, bad for humans, animals, and our environment. The number of Oakland kids with lead in their blood is 3xs higher than the national average and higher than Flint, MI. Our lead poison comes from lead paint used in 80% of Oakland’s housing stock built before 1978. People of all ages, races, ethnicity, and socioeconomic status can’t see the poison so they can’t find it, fund it, or fix it. Aggression, anemia, Alzheimer's Disease, Autism, Attention Deficit Hyperactivity Disorder, brain damage, cancer, Dementia, hearing impairment, heart attacks, high blood pressure, infertility, IQ loss, kidney failure, low educational attainment, personality disorders, premature death, special education requirements, speech impairments, and violent criminal behavior. 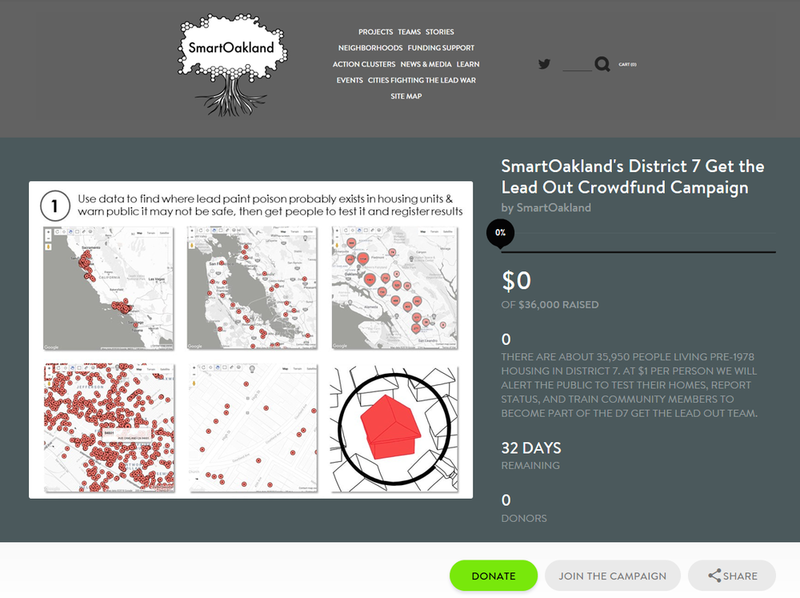 SmartOakland’s been working non-stop since 2016 after the Ghost Ship Warehouse Fire killed 36 people and two weeks later Reuters broke news of lead poisoning in housing, soil, dust, and air in Fruitvale. We chose to step up and create a system to use data and Internet of Things technologies to locate and warn the public of invisible threats and opportunities to navigate and safely find, fund, and fix problems faster. Now we’re able to see, understand, decide, and act on risks before it’s too late to change what’s coming. Our solution is endorsed by the National Institute of Standards and Technology (NIST) and now we need to ask you for your financial contribution to help us use it here to Get the Lead Out of Oakland. Your money will provide predictive data visualizations of at-risk-for-lead-poison housing locations, integrated with Google Maps, for District 7 constituents to review locations on phones, laptops, or in print to see which places should be checked out. As people report findings we’ll learn which locations require scientific testing, clean up funds, and contractors so we can help facilitate remediation of lead from our homes, soil, dust and air. There is no agency reporting housing maintenance, like when a unit has been repainted, so some locations we’ve identified could be OK and some could be worse than we predict. People in pre-1951 housing may also be eligible for settlement funds awarded to 10 CA counties & cities – Oakland being one of them – thanks to Alameda County and others for fighting an 18-year battle suing lead paint manufacturers for creating toxic hazards for millions of Californians. GTLO helps these folks too. It only takes a few seconds to breath lead dust inside your home, run through soil or eat vegetables from a lead-filled garden, or walk by a construction site lead dust cloud to be exposed to poison. We have visualizations and directions ready for you, right now. Thank you for your immediate attention and for joining us today! Sources: EPA, CDC, WebMD, MPRA, Dementia.org, Medscape, Environmental Health Perspectives, Naset.org, Cleveland.com, Science Daily, Mother Jones, The Epoch Times, American Cancer Society, University of Rochester Medical Center, Science Magazine, FBI.gov. In 2012, CA DPH reported 7.57% of Oakland children tested for lead in their blood met the CDC definition of “lead poisoned”. That number is 3xs higher than the national average of 2.5% and 1.5xs higher than Flint, MI at 5%.